LOVELAND, Ohio - Drone delivery may be closer to reality than you think! And not only in England, where Amazon is testing it. A local company is testing it in the Tri-State right now. A Loveland company, Workhorse, is testing its delivery drone, HorseFly, around its own neighborhood. The future of home delivery may look like a regular white box truck. “People should not be afraid of drone delivery. It is very safe,” said Jeffrey Bennett, Workhorse Aerospace Project Manager. At least that is what Workhorse is setting out to prove. Its vision of drone delivery is a little different. The idea is that the drone is an assistant to the truck driver. We flew Sky9 along with a test flight Thursday. Workhorse calls this drone HorseFly. Once loaded, it launches from a delivery truck and soars to its destination autonomously. It can lower a package from 15 feet at a location you set. Workhorse says it's a time saver. 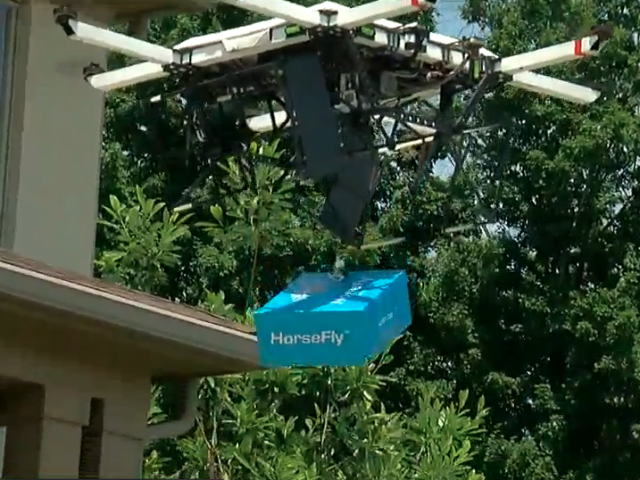 While a delivery driver is dropping off packages nearby, Horsefly can go to an address farther away. And it's a cost saver. Bennett has worked on HorseFly since he was a co-op at UC. “Yeah, it’s my baby.” he said. Well, not his just his. There’s a team of 12. It's an idea whose time has come, Bennett said. “This is realistic. We are testing every day, five days a week to see what these real-world applications are like,” Bennett said. All born in a nondescript warehouse in Loveland. Its weekly tests have to happen in neighborhoods with low trees and no big power lines. When Workhorse started its testing a little more than one month ago, they had about 40 people signed up. But as people have seen these drones testing in their neighborhood, they're now up to 55 and they still have a little more than one month to go. “Our immediate response was, we want to be a partner,” Loveland City Manager Dave Kennedy said. The city has been helping Workhorse get things through the Federal Aviation Administration. “We're hopeful for being promoted as a progressive community that supports technology,” Kennedy said. And of course, there's an app for that. It's where you set drop off point and track the drone in real time. “If we can land on top of the truck and deliver packages in 23-mph wind in rain, snow and shine, we will consider that a success.